For a thesis, the choice of tools is far less important. For my own writing and research projects, the big bottleneck is my thinking speed. When choosing tools for your thesis, the goal is thus mostly to avoid waste. Set up a backed-up version control system for your thesis. Version control provides an unlimited undo for your work. It also makes it easy to continue working on a different machine, if yours should crash. Host the repository on a server that performs reliable automated backups. Your supervisor typically has access to such a server. Use it for your text. Also use it for all your other thesis-related data, such as literature, whiteboard photos from meetings with your supervisor, source code and data. Ideas come when they, not you, feel like it. Conserve them in your notes. To capture a large part of your ideas, set up a note-taking system that makes it as easy as possible to take down notes. I use Evernote, since it allows me to take notes with all my devices (and I carry my smart phone with me most of the time). I recommend JabRef for reference management. Develop a habit of storing Bibtex of interesting papers right after you read them. Otherwise, prepare to go on reference search late, when you don’t really have the time to do so anymore. 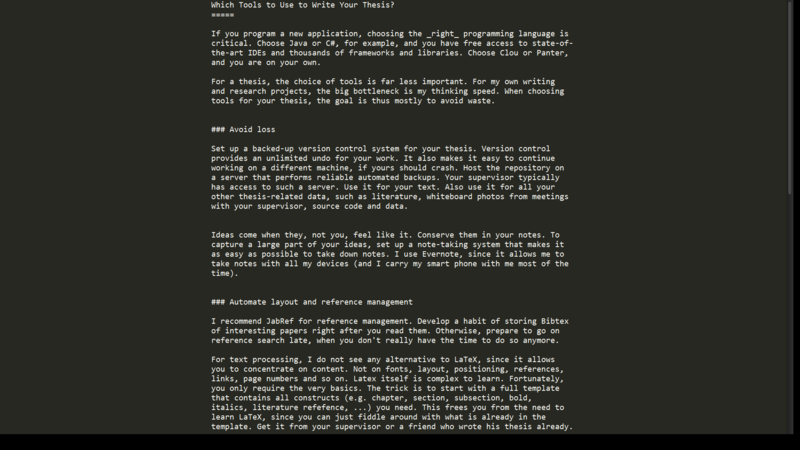 For text processing, I do not see any alternative to LaTeX, since it allows you to concentrate on content. Not on fonts, layout, positioning, references, links, page numbers and so on. Latex itself is complex to learn. Fortunately, you only require the very basics. The trick is to start with a full template that contains all constructs (e.g. chapter, section, subsection, bold, italics, literature refefence, …) you need. This frees you from the need to learn LaTeX, since you can just fiddle around with what is already in the template. Get it from your supervisor or a friend who wrote his thesis already. I also deactivate any applications that can interrupt me during writing (such as email, instant messaging, …). Thanks to the guy who set it up if he should ever read this! How to Get Great Supervision?